How Bad Are iPods for Your Hearing? Can I Go Deaf From My iPod? Hearing loss is more common than ever before. About 16% of American adults have an impaired ability to hear speech, and more than 30% of Americans over age 20  an estimated 55 million people  have lost some high-frequency hearing, according to a new study published Monday in the Archives of Internal Medicine. The finding has got experts  and concerned parents  wondering anew: Does listening to loud music through headphones lead to long-term hearing loss? Brian Fligor, director of diagnostic audiology at Children's Hospital Boston, explains how much damage your headphone habit might cause  and how to mitigate your risk. Q: How much hearing loss does an iPod cause? A: It depends on the person, it depends on how long you're listening, and it depends on the level at which you're setting your iPod. 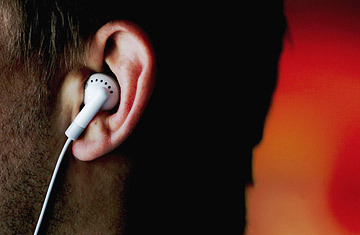 If you're using the earbuds that come with an iPod and you turn the volume up to about 90% of maximum and you listen a total of two hours a day, five days a week, our best estimates are that the people who have more sensitive ears will develop a rather significant degree of hearing loss  on the order of 40 decibels (dB). That means the quietest sounds audible are 40 dB loud. Now, this is high-pitched hearing loss, so a person can still hear sounds and understand most speech. The impact is going to be most clearly noted when the background-noise level goes up, when you have to focus on what someone is saying. Then it can really start to impair your ability to communicate. This would happen only after about 10 years or so or even more of listening to a personal audio device. One patient I had used his headphones instead of earplugs when he was on his construction job. He thought as long as he could hear his music over the sound of his saws, he was protecting his ears  because he liked the sound of his music but didn't like the sound of the construction noise. He had a good 50 dB to 55 dB of noise-induced hearing loss at 28 years old. We asked a few pointed questions about when he was having difficulty understanding people, and his response was classic. "When I'm sitting at home with the TV off, I can understand just fine," he said, "but when I go out for dinner, I have trouble." There is huge variation in how people are affected by loud sound, however, and this is an area where a number of researchers are conducting studies. Certainly a huge part of this is underlying genetics. We know how much sound causes how much hearing loss based on studies that were conducted in the late '60s and early '70s, before employers were required to protect workers' hearing in noisy work environments. What was found is that when people are exposed to a certain level of noise every day for a certain duration, they're going to have a certain degree of hearing loss on average. But the amount of hearing loss might differ by as much as 30 dB between people who had the toughest ears and those with the most tender ones  a huge variation. Unfortunately, we don't know who has the tougher ears and who has the tender ones until after they've lost their hearing. So, as a clinician, I have to treat everyone as if they had tender ears. Particularly with noise-induced hearing loss, the primary area where the ear is damaged is not the eardrum, not the part of the ear that you can see and not the bones that are inside the middle ear  it is actually deeper inside. It's where the nerve that brings the sound message up to the brain connects with the inner ear, and it involves some very specialized cells. These are hair cells, and specifically we're looking at the outer hair cells. When they're overexposed or stimulated at too high a level for too long a duration, they end up being metabolically exhausted. They are overworked. They temporarily lose their function, so sound has to be made louder in order for you to hear it. These cells can recover after a single exposure, but if you overexpose them often enough, they end up dying, and you lose that functional ability inside your inner ear. The cells that die are not replaceable. As far as a rule of thumb goes, the figures we got in our studies were that people using that standard earbud could listen at about 80% of maximum volume for 90 minutes per day or less without increasing their risk for noise-induced hearing loss. But the louder the volume, the shorter your duration should be. At maximum volume, you should listen for only about 5 minutes a day. I don't want to single out iPods. Any personal listening device out there has the potential to be used in a way that will cause hearing loss. We've conducted studies of a few MP3 players and found very similar results across the MP3 manufacturers. Some in-the-ear earphones are capable of providing higher sound levels than some over-the-ear earphones. That said, studies we've done on behavior show that the type of earphones has almost nothing to do with the level at which people set their headphones. It's all dictated by the level of background noise in their listening environment. When we put people in different listening environments, like flying in an airplane  we used noise we'd recorded while flying on a Boeing 757 commercial flight, and we simulated that environment in our lab  80% of people listened at levels that would eventually put their hearing at risk. On the subway system here in Boston, the ambient noise levels are very comparable to the level on an airplane, although it sounds very different. The noise is sufficiently high that it induces people to listen to their headphones at excessively loud volume. I'm a self-professed loud-music listener. I use my iPod at the gym, and I love it. I think it's one of the greatest inventions ever. I even advocate that people listen to music as loud as they want. But in order to listen as loud as you want, you need to be careful about how long you're listening. I would also strongly recommend that people invest in better earphones that block out background noise. Some of the research we did studied earphones that completely seal up the ear canal. These are passive sound-isolating earphones, as opposed to the ones that are active noise cancelers that block out some of the noise. As far as I can tell, both would allow people to listen to their headphones at their chosen level  and more likely at a lower volume than if they were using the stock earbuds.